It has been evident since the government was elected that it would take time to learn whether a fruitful agreement could be reached. It is necessary to “buy” that time. In seeking to reach a deal, it would also be helpful to put destructive moralism to one side. The creditor side considers its generosity to profligate Greeks exemplary. The Greeks believe that private lenders were guilty of irresponsible lending, that the “rescue” was not of Greece but of those selfsame careless lenders and, above all, that Greeks have suffered enough. Both positions have merit. But no good will come from hurling such charges at one another. Assume that an accident is avoided. Then the eurozone faces a big choice and a smaller one. The big choice is whether to keep Greece inside the eurozone or help it leave. The smaller choice is between alternative ways of keeping it inside. Keeping Greece in leaves the option of exit open, but exit is probably irreversible. What are the arguments in favour of exit? One is that the costs of contagion to other members are far lower than earlier, as the divergent spreads in yields on government bonds indicate. Against this, exit would transform the eurozone from an irrevocable currency union into a regime of hard exchange-rate pegs. That would be the worst of both worlds: neither as credible as a union nor as flexible as floating rates. Moreover, exit — particularly if unassisted — could cause grave economic and geopolitical consequences. Greece might plunge into an economic abyss. Abandoned by Europe, it might turn towards unfriendly powers. This would be a strategic disaster. Finally, Greece has already suffered the pains of austerity. From now on, things should get better, provided policy improves. Trying to keep Greece inside the eurozone looks the better choice. I can identify two options. The first would be a further rescue programme, one that promised relief from Greece’s debts after the reforms are completed. The second option would be to end the policy of “extend and pretend”. Instead, debt service obligations would be reduced to manageable levels. But there would be no further assistance. Greece would be on its own. The Greek government would keep the euro, but might need to impose controls on the currency’s use. In the short run, the government might also supplement euros with domestic IOUs that can be used to meet obligations to the Greek state. It would then have turned the euro into a parallel currency, either temporarily or semi-permanently. The other big option is for the eurozone to agree that for Greece continued membership cannot work. The best justification for this would be that the Greek economy will be unable to be competitive inside the eurozone. Yet Greece would not just crash out; it should be helped out, instead. That help would, once more, have to include permanent reductions in debt service. Controls on withdrawals from banks would again be needed. In addition, Greece would require further loans to prevent an overshoot in the value of the new currency. Greece would of course remain in the EU. The possibility might even be left open that it could return to the euro in the distant future. None of these options is without risk. All are going to create significant problems. But there are at least two fundamental points to be borne in mind. The first is that the decision must be deliberate, not the result of running out of time. The second is that the choice to be made is a strategic one, both for the eurozone and for Greece. On balance, I believe the right choice — and certainly the one the Greeks themselves want — is to discover a mutually satisfactory way to keep Greece inside the eurozone, along with generous but conditional debt relief and further time-limited support. But a case can also be made for exit, provided it is done in a way that contains chaos and achieves a permanent improvement in Greek competitiveness. But this, too, would require substantial debt relief. Now is not the time to make the big decision on whether to keep Greece inside the eurozone and, if so, how. But it will come soon. So prepare properly. “They want us to impose capital controls and cause a credit crunch, until the government becomes so unpopular that it falls," said one official. "They want make an example of us, and demonstrate that no government in the eurozone has a right to have mind of its own. They don’t believe that we will walk away, or that the Greek people will back us, and they are wrong on both counts,” he said. The situation is now critical. Even if Greece manages to cobble together enough money to cover the April deadline, it owes the IMF a further €200m on May 1 and €763m on May 12. A Greek official told EMU counterparts at a teleconference on Wednesday that the country has run out of money. "There is no way we can go beyond April 9," the official reportedly said. “We should remember that there are poorer countries that are lending money to Greece, so to propose a cut to their debt would be certain to receive a no from their partners," he said. Overhead chart resistance centered between $1225-$1220 has proven to be a bride too far for the gold market. That region has now been confirmed with today's plunge as a formidable barrier that gold bulls will have to overcome if there is ever going to be anything besides "boring" in the gold market anytime soon. Notice on the ADX/DMI, that the short-lived move higher coming off the heels of the FOMC statement has seen the ADX turn down, as well as the +DMI. Also, the RSI has failed at the 60 level, a level which tends to hold bear-market rallies. I still go back to the fact that gold is moving inversely to the yield on the Ten Year Treasury note. When interest rates rise, as they did today, gold tends to struggle. An offshoot to the higher rates is strength in the US Dollar, which also pressures gold. It will be interesting to see if the next update on reported holdings of GLD shows yet another decline. Here is a weekly chart of gold showing that it remains well inside the channel that has held it since the summer of 2013. First level of support remains near $1180. Below that another layer of support emerges near $1150-$1145. The gold shares remain a giant TRAIN WRECK. Why anyone would want to own these juniors in particular escapes me. The chart is atrocious as they remain in the red on the year. Lastly along this line, the GDXJ/Gold ratio continues to head in its favorite direction, namely lower. By the way, a few random thoughts about gold and its proponents. Most of you know by now, that I regard gold as INSURANCE; nothing more and nothing less. It is simply another asset class. Sometimes it is in favor and does well; sometimes it is out of favor and does not do well. Many gold bugs seem to forget that gold can go long, long periods doing absolutely nothing to improve ones portfolio. Think about the 20 long years from 1980 to 2000-2001 when gold went nowhere but down. For twenty long years, those who had pinned their investment hopes exclusively on gold, missed huge opportunities to grow their wealth by diversifying. Yet, many of them who remained bullish for those twenty years, believed that they were rewarded for keeping the faith. 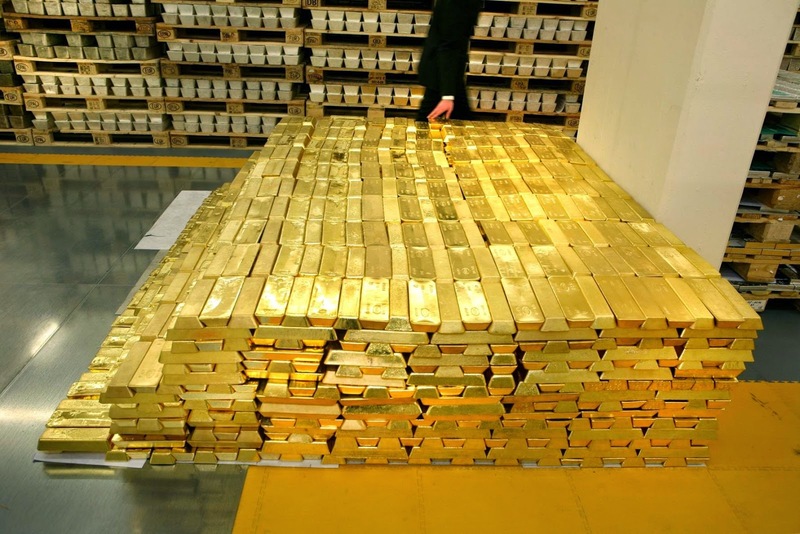 They cite the fact that gold rallied from near $250 to slightly over $1900 in 2011 as proof that it pays to own gold. That would be true but that assumes that one who bought gold actually SOLD IT and captured the profits. The problem with gold bugs is that one never or at least rarely, hears them talking about doing just that. For them, it is always onward and upwards to the next new high, even if it takes 20 years to get there. That most did not sell and capture the gain, means that they have lost nearly half of any paper gains that they might have made back in 2011. I do not know about the rest of you, but watching any investment lose 50% of its value is a sure-fire method of short-circuiting any chance of making serious progress in one's long term investment strategy. I guess what I am saying here is that for some reason, gold tends to feed the pessimistic streak in all of us. Think about it - for one to be bullish gold, it means that one must also be negative towards the entire financial system or at the very least, the US Dollar. That translates into what I believe is an unhealthy OBSESSION with bad news. Driving in my truck today, I heard yet another one of those "quick - head for the hills because the Dollar is going to crash", annoying ads that **** Capital seems to love to unleash upon us. This time it is all about "Alan Greenspan's warning of financial instability", so hurry up and load the boat with more gold. After enough of these, one soon gets a feeling of nausea and disgust that it is the same thing, time after time, year after year, with these people. "The entire world is going to end tomorrow so make sure you spend lots of your money buying gold from us." This is also why some of you who are on the mailing lists of these many gold cult members who infest the internet, will almost daily find your email inbox filled with one story after another about how bad this is, or how bad that is, or how soon this will collapse or how soon that will collapse. Each piece of economic news that seems to indicate slowing growth is therefore heralded as if it is some precursor of what is a guaranteed soon-to-be financial Armageddon. This is to be expected for the reason I noted above - in order for one to be bullish gold, one must, by necessity, be hoping for bad news. That strikes me as a particularly depressing way of going through life. Please do not misunderstand what I am saying here - one can hold the yellow metal as a form of insurance without having this perversely depressing morbid outlook on life that seems to infect so many gold bugs. After all, most of us have insurance on the homes we own or against catastrophic health issues, or our cars, or life insurance. But here is the difference - those who are MENTALLY stable NEVER, NEVER, NEVER actually HOPE to collect on it. We buy it hoping the exact opposite, namely, that we will NEVER NEED it. What would our lives consist of if we transferred the mental state that marks the average rabid gold bug to our home, auto, life or health insurance? That means I would be cheering that the fire in my next door neighbor's home would spread to mine. It means that I would be anxious to get the same horrible disease that some friend or acquaintance was unfortunate enough to be smitten with. It means that I would be anxious for the car wreck, all so that I could collect on my auto insurance coverage. It I think you see my point. Foolish it is not? Seriously, what would you think of any such person with those sorts of HOPES who would fill your email box with stories about fires in his neighborhood and sounded actually excited about the prospect??? Serious-minded investors/traders must avoid falling into this sort of mentality. Remain objective, level-headed and above all, watch out for the sensationalism that pervades the world of the gold bugs. Buy some gold, hold it for insurance, and then get on with your investing life! You'll be a lot happier an and a lot more fun for family and friends to be around. Prime Minister Manuel Valls of France has presented yet another antiterrorism bill to Parliament. French lawmakers, who overwhelmingly approved a sweeping antiterrorism bill in September, are scheduled to debate the new bill this month. Mr. Valls argues that the bill’s sweeping new provisions for government surveillance are necessary to monitor potential terrorist-related activity, especially on the Internet and cellphones. Mr. Valls, who announced the bill on the day after the deadly attack at the National Bardo Museum in Tunis and as France still reels from the terrorist attacks in Paris in January, has assured the nation that the bill “is not a French Patriot Act,” a comparison to America’s post-9/11 law. But, in a statement on the bill, the Digital Council, which advises the French government about technology’s effects on society, referred specifically to Edward Snowden’s revelations of the extent of United States government surveillance, warning that the bill proposed by Mr. Valls would open the door to similar excesses in France. Rights groups have warned that the bill, which includes the risk of “collective violence” and “the defense of foreign policy interests” among potential reasons for government surveillance, is too vague in defining who is a legitimate target. The bill also concentrates extraordinary power in the office of the prime minister by giving it, rather than judges, control over the approval process for surveillance requests from intelligence agencies. Parliament must restore judicial oversight to these decisions that touch the core rights and freedoms of French citizens. The bill also jeopardizes freedom of the press. Under the terms of the bill, journalists risk triggering unwarranted government surveillance simply by doing research they need to do on the Internet to report the news. Reporters Without Borders warns the bill would seriously compromise journalists’ ability to protect sources, as well as their ability to quote or relay via visual media the statements of any group or individual deemed terrorist by the government. I’ve never owned a foreign sports car, I wear a Timex instead of a Rolex, I’d rather drink a Coors Light than a glass of Pinot Noir, I don’t golf, I’ve never been to Paris, I drink Folgers coffee like my father did, I’ve been married only once, and my idea of a good time is watching my boys play baseball or hiking in Glacier National Park. I will forever be the son of a hardworking, simple vegetable farmer. Yuppies, however, have been a powerful consumer bloc and have had a great impact on both the economy and the stock market. Investors who bought stock in companies that catered to yuppies have done well. The Chuppies are the rapidly growing, new middle class being created by the booming Chinese economy. Chuppies are well educated, ambitious, have money burning a hole in their pockets, and are more label-conscious than the worst gold diggers in Los Angeles. Just like with American yuppies, you can make a lot of money by identifying how they are spending their money and investing in the companies that cater to them. The clothes Chuppies wear. When it comes to apparel, the Chinese crave designer labels. Sure, Chinese teenagers wear clothes from The Gap (GPS), V.F. Corp.’s (VFC’s) Lee Jeans, and Abercrombie & Fitch (ANF), but the successful professionals are big buyers of Prada (PRDSY), Richemont (CFRUY), and Ralph Lauren (RL). The food Chuppies eat. There are not many things more American than the hamburger, but I seldom see long lines at McDonald’s and Burger King stores in China. Why not? Asians much prefer chicken to beef, which is why Yum! Brands’ (YUM’s) KFC stores are almost always jam-packed with customers, and why more than 50% of Yum Brands’ revenues come from outside the US. Lastly, the Chuppies often finish their meals with a sweet donuts from Krispy Kreme (KKD) or a latte from Starbucks (SBUX). The status symbols Chuppies flaunt. Successful Chuppies are very eager to show their success and are very conspicuous consumers, which is why Tiffany (TIF), Coach (COH), and Louis Vuitton (LVMUY) stores are doing gangbuster business and why I see more Bentley, Rolls Royce, BMW, and Porsche cars in Shanghai than I do in Seattle. The way Chuppies spend their vacations. One of the most popular things that Chuppies are doing with their money is spending it on travel, especially within China. It wasn’t that long ago, when the communist rule was stricter, that travel wasn’t practical and was often prohibited. But now, thanks to aggressive infrastructure spending on railroads, airports, roads, and bridges, the Chuppies are making up for lost time. Hotel chains like Homeinns (HMIN) and Intercontinental Hotels Group (IHG) are almost always close to fully booked; airlines like Cathay Pacific (CPCAY) and China Eastern (CEA) are filled to the rafters; and online travel agent Ctrip.com (CTRP) pulled in US$1.2 billion in sales in the last 12 months. I have traveled all over Asia and there is one place that is benefiting from the Chuppie spending boom more than anywhere else. I’m not talking about the Great Wall of China, the Bund in Shanghai, or Nathan Road in Hong Kong, but about the Las Vegas of Asia: Macau. Macau is the only location in China where gambling is permitted. And boy, do Asians love to gamble. Get this: more money is gambled in Macau than in Las Vegas. Not just a little more…a LOT more. In fact, 600% more! If you saw the high stakes being bet in Macau, you’d understand exactly what I’m talking about. The Chuppies—plus gamblers from Japan, Taiwan, South Korea, Singapore, and other countries—flock to Macau to try their luck. Every time I go to Macau, I am shocked at how drastically the skyline has changed. Dozens of previously empty lots are now filled with steel girders stretching to the sky, filling the bulging demand for residential and office space. Macau real estate is appreciating so rapidly that many of the service workers—dealers, waitresses, cab drivers, maids, and cooks—are moving to a neighboring city called Zhuhai. Here’s what should matter to you as an investor. All those glamorous casinos in Las Vegas were NOT built with the money from winners. So if Macau is out-gambling Las Vegas, that should tell you volumes about how profitable the casinos there are, and that Macau casino stocks are worth your consideration. There are four public gaming stocks that are doing business in Macau: Las Vegas Sands (NYSE:LVS), Wynn Resorts (Nasdaq:WYNN), MGM Resorts (NYSE:MGM), and Melco Crown Entertainment (Nasdaq:MPEL). All four of the above stocks are traded on the NYSE or Nasdaq, so they are as easy to buy as Boeing or Apple. Bottom line: I’ve traveled all over Asia and no place is as vibrant, growing, and packed with opportunity as Macau is. Warning: The above list is not a buy list. One of those four is an absolute dog, one is insanely overvalued, and one is okay—but one of them is an absolute steal that I think is an easy double by 2017. In a future edition, I’ll tell you more about the one gaming stock I think could double. Inflowing Liquidity was in Expansion, with an up tick and stuck inside a triangle. A quick look at the Inflowing Liquidity chart shows that Liquidity was in expansion, moving higher, and stuck in a triangular pattern. It won't be inside that triangular pattern much longer, and when it breaks out, it will take the stock market in the same direction.